Square Roots, the one-of-a-kind craft beer and music experience, returns to Lincoln Square July 11-13 with more than 50 acts on four stages, and 30 regional craft brews paired with Lincoln Square’s finest restaurants and artisans. 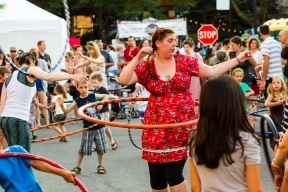 Presented by the Old Town School of Folk Music and the Lincoln Square Ravenswood Chamber of Commerce, the three-day festival will feature music, dance parties, participatory jams and plenty of family fun activities. For event details, call 773-728-6000 or, visit www.squareroots.org. Several popular Midwest breweries will have a presence at Square Roots including Two Brothers, 5 Rabbit, Lagunitas, Ale Syndicate, Temperance, Virtue Cider and Revolution. The full beer list can be found at http://squareroots.org/beer/. Lincoln Square’s restaurant scene will also be on hand serving up amazing dishes for guests to enjoy with the craft beer pairings. 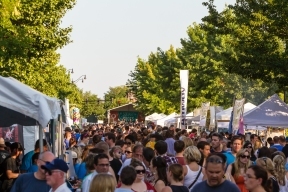 Participating restaurants include Fountainhead, Bistro Campagne, Himmel’s, Monti’s, Big Fork Brand’s, Byron’s Hotdogs, Cheesie’s Pub and Grub, Dinky Donuts, Gather, Bo’s Concessions and Jo Snow. To view a full list of menu offerings, visit http://squareroots.org/vendors/. Bring the whole crew by for a Family Barn Dance with kid performers, sing along with kids music favorite Laura Doherty & the Heartbeats, and walk along in a Brazilian Parade with instruments that you make in the art tent, and much, much more! © 7158 Chicago Hispanic Newspaper, Lawndale News, Hispanic Bilingual Newspapers, Su Noticiero Bilingue. All rights reserved. XHTML / CSS Valid.